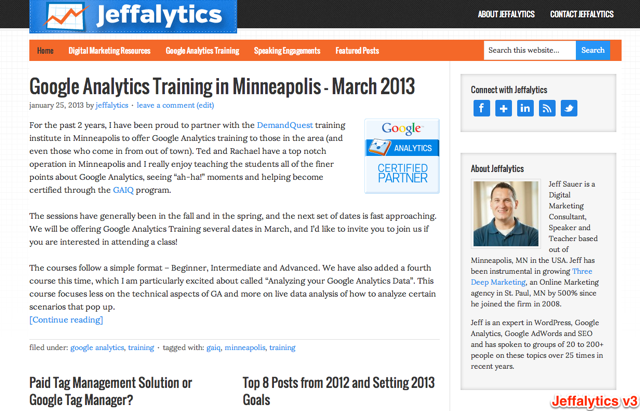 For the third time since Jeffalytics launched in September of 2012, we have a new theme on the blog. While that may seem like an alarming rate, I actually view it as a natural progression for a new website starting out. Why would that be? Well, the reality is that when you start a site you are content thin. Most modern themes are built with the assumption that you will have a significant amount of existing content that their theme will house nicely. In my case, I started on a whim with 0 content. As I have started to build more content into the site, I realized that each of the first two themes I used simply did not fit my needs. While many people may decide to stick it out with a theme, I thought ahead long ago and purchased the Genesis Framework developer pack which allows me to switch between several themes without incremental expense. This is very helpful as the site grows over time, because there should always be themes available that fit the needs of this site. 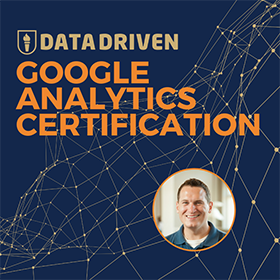 In addition to adding content over time, I have also been working with a great designer to help bring a more professional and graphically appealing presence to the work I’m doing on Jeffalytics. 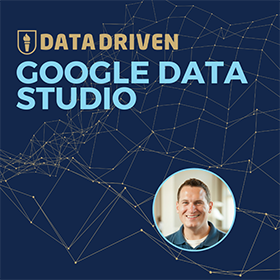 His name is Mark and you may have noticed his handiwork on the two Google Analytics Predictions posts that went up at the end of last year. In addition to helping with graphics for posts, Mark also designed a logo for Jeffalytics and suggested some headers for the site as well. Since this blog is dedicated to publishing transparent and long form content about all topics of digital marketing, I thought I would give some tips as to how to choose the right theme for your blog, and some of my struggles getting started. This weekend I spent a great deal of my time making a new theme/template a reality. 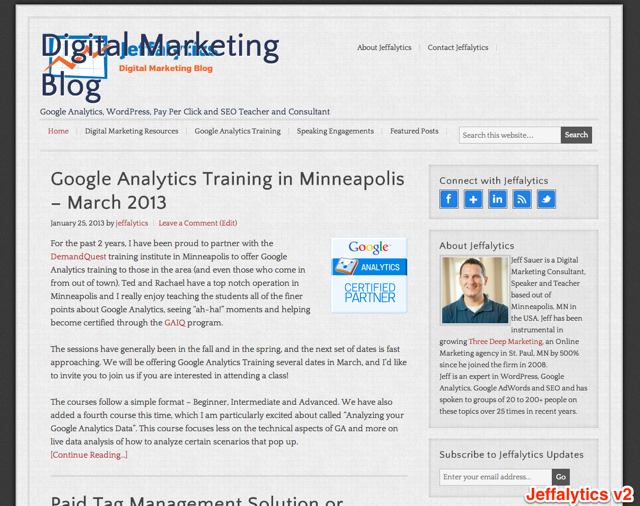 I specifically needed to improve on the flaws that were noticed with the first two themes from Jeffalytics. The first theme I chose looked great in “preview” mode, but did not lend itself well to the design of the site. The homepage was difficult to set up and required graphics to look good. I eventually ended up making the home page the most recent blog post, which was ugly and unnavigable. In addition, the main navigation was tight and stuck in a corner across multiple lines and did not draw attention very well. They also required a logo or your blog title in the upper right corner, which I had not developed yet. I can’t really find much positive about this theme, actually, and it was quickly ditched about a month into the sites existence. Much like how we look back on our first love, I guess I can understand what attracted me to this theme in the first place, but I am so much better off having left when I did. This is the theme that most visitors to Jeffalytics are likely used to seeing. I found it to be very classy and have a nice presentation blend between content and biographical information. 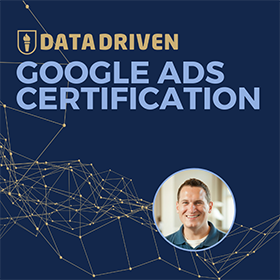 It was a very clean and fully responsive design, which meant it displayed content well across many formats… well, in most cases. I ended up moving away from this theme for several reasons, none of which may seem like as big of a deal as I considered them to be. The font was really hard for me to read on a grey graph paper background. I had a hard time reading my posts after I published them and noticed they looked much better on white backgrounds in email/the wordpress editor. If I am struggling and I am passionate about the content, I can imagine other people would struggle even more and simply leave the site before finishing reading. It was just too bland. Nothing jumped out and not enough imagery. While I love the logo, I just wasn’t feeling how it fit into the site and this theme. 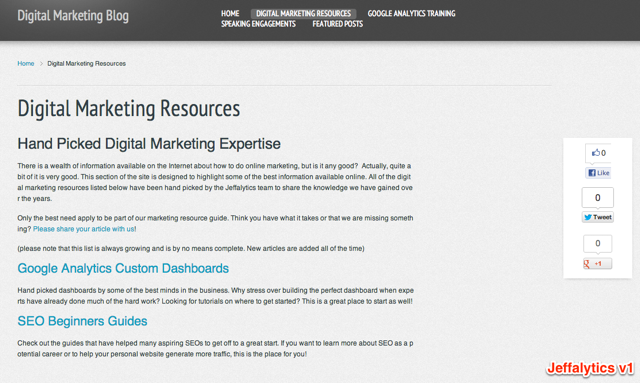 I didn’t like how the responsive design theme conflicted with the header I added to the site. If you look at the screenshot below, you’ll see that this proved disastrous when viewing the site on any device with a screen lower than 800px. The goal of Version 3 was to fix the 3 major problems above. I needed it to be easier to read on both desktops and tablets, and I needed to better incorporate the new logo. I am pretty content with the result right now, but I do think that now that development is complete I will need it to pass a design eye. I also like how this theme takes even more advantage of screen real estate and gives over 800px for the main content of the site. This is a significant increase over most available themes on the market and allows for a better viewing experience. This is by no means the last that we will see of new themes on this site, because I am using this site as a test ground for many projects, and I get tired of designs quite easily. Looking for the right theme for your site? Here 8 Must Ask Questions for Choosing a WordPress Theme.